"We have given them the pictures they want" was the despairing reaction of one Spanish politician to the events in Catalonia this past weekend. The images of police beating pro-independence demonstrators in Barcelona handed a political victory to Catalan separatists. Those pictures are likely to radicalise opinion in Catalonia, and gain sympathy for the separatist cause overseas. Thankfully, nobody has yet been killed. It should still be possible to calm the situation in Catalonia. But the Spanish government badly needs to reconsider its counter-productive tactics. It is true that most European states were once put together by violence. But in the modern era, they should be held together only by consent. It is possible that the central government in Spain could renew that consent with an offer of enhanced autonomy for Catalonia. But the weekend's events make it likely that Spain will ultimately have to allow a vote on Catalan independence. The government of Prime Minister Mariano Rajoy is right that an independence referendum is technically illegal and against the Spanish Constitution. Madrid is on solid ground if it rejects any Catalan declaration of independence, based on Sunday's unofficial and chaotic plebiscite. But by arresting officials and beating demonstrators in Catalonia, the Spanish government risked a catastrophic loss of legitimacy - with grave long-term consequences. To accept that Catalans should, under the right circumstances, be allowed to vote on independence is not to embrace the idea that the separatist cause occupies the moral high ground. Catalonia is not Timor-Leste before 2002 or Estonia before 1989. In the 40-odd years since the restoration of democracy in Spain, Catalonia has become one of the most prosperous and envied parts of Europe and its people have enjoyed the rights and benefits of a modern democracy - as well as considerable autonomy from the Spanish state. On an emotional level, I have some sympathy for Madrid. The experience of living through the Scottish independence vote of 2014 taught me how traumatic the idea of breaking up a country can be. It also cured me of the idea that Scottish or Catalan nationalism is inherently right or romantic. People hold on to Catalan separatist flags on top of an air vent during a demonstration two days after the banned independence referendum in Barcelona, Spain, on Oct 3, 2017. Nonetheless, the Scottish experience also convinced me that democratic countries that want to stay united have to be willing to accept the possibility of divorce. This can be a nerve-racking experience. Scotland, which has been part of the United Kingdom since 1707, voted to stay within the union by only a 55-45 per cent vote. Canada came even closer to breaking up, when just 50.58 per cent voted against independence for Quebec in a referendum in 1995. It is important to acknowledge that Catalan independence would be an even heavier blow to Spain than Scottish independence would be to Britain. Catalonia accounts for about 19 per cent of Spanish gross domestic product, while Scotland represents about 8 per cent of the UK economy. Catalonia has also been part of Spain for more than three centuries. But by refusing Catalonia a vote, the Spanish government risks giving credence to the separatists' arguments that modern Spain has not truly shaken off its authoritarian past. Allowing an independence referendum need not mean making separation easy. One conclusion from the Scottish vote is that breaking up a country should require more than a simple majority. Demanding a super majority for constitutional change is common practice worldwide. The Spanish government could offer an independence referendum with a threshold for success of, say, 60 per cent of votes cast. A referendum campaign and the debates that follow would also make the difficulties of Catalan independence very clear. 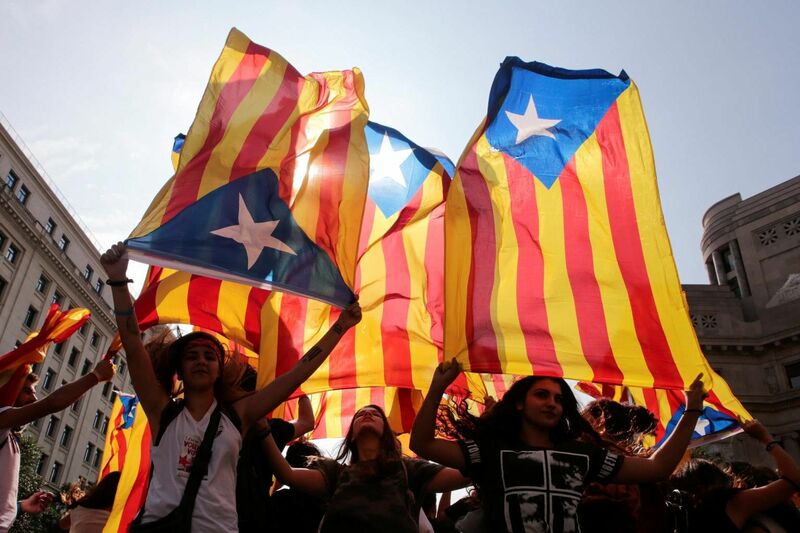 An independent Catalonia would have to leave the European Union and then apply to rejoin. As the British are discovering, the consequences of leaving the European single market are potentially dire. Even the threat that Barcelona's football team might be excluded from the Spanish league would count a lot to many voters. The events in Catalonia should also make the rest of Europe think. It is the EU's proud boast that it is moving Europe towards a "post-national" future, in which countries pool sovereignty and move beyond old conflicts. Yet the uproar in Spain is the latest evidence that national identities still matter in Europe. The Brexit vote and the resurgence of nationalist parties in France, the Netherlands, Poland and even Germany suggest that the EU needs to think harder about pressing forward with a federalist agenda for "more Europe". The EU's institutional structures are ill-equipped to allow it to play a mediating role between Madrid and Barcelona. Spain is the sitting member-state and therefore has the ability to insist that its view of the conflict prevails in Brussels. But while the EU has no formal legal or diplomatic role in this dispute, the other European states should be able to play the role of a candid friend to the Spanish government. Behind the scenes, they should be urging Madrid to avoid the use of force in Catalonia. An offer of greater autonomy should be tried. But, in the end, Spain may have to concede an independence referendum - if that is what the elected government of Catalonia demands.